When you connect Calxa to your accounting system it links your general ledger actuals and allows you to create multiple projections of budget data against that general ledger. Metrics extends this by allowing you to capture monthly budgets and actuals for any additional ‘Metrics’ or values that are not part of your financial accounts. These values can then be used directly in custom KPI formulas and delivered in Calxa reports via these KPIs. Whether you are looking to calculate unit costs such as ‘cost per hour’ or ‘cost per activity’ or you are wanting to capture non-financial info like ‘number of customers’ or ‘casual wage hours’, metrics combined with KPIs can help you easily deliver these as part of your monthly management reports. Select Metrics Actuals or Metrics Budgets to edit actuals or budgets respectively. Select the Business Unit, Financial Year and if editing Metrics Budgets the Budget Version you would like to edit and click Open. For an overview on business units and budget versions please refer to our help note Understanding Calxa Business Units and Budget Versions. Click New to create a new metric then edit the name as required. Note: Because metrics are used directly in KPI formula the metric names must start with a letter (A-Z) and can only contain letters (A-Z), numbers (0-9) and the apostrophe or space symbol. They must also be unique across all Metrics and KPI Account Groups. You can then type values into the total or monthly cells. Tab, enter and arrow keys may be used for navigation between cells. If you enter a total value the monthly values will be split with the same monthly proportions that existed prior to editing the total. Therefore totals can be edited but the monthly fluctuations or seasonality is retained. Note: all values are saved to the database automatically. Click Back to parameters to return to the parameters screen where you can choose another combination of business units, years, budget versions or actuals to edit. When you enter your metrics at the project/job/tracking category level rather than at the organisation level you will need to tell Calxa to consolidate these for reporting purposes. Using the instructions in steps 2 and 3 above select the Organisation level business unit and click Open. 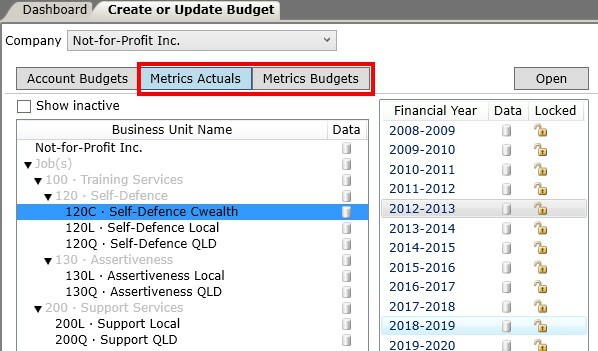 Select the business unit level where you entered your metrics actuals and budgets from the Consolidate by: drop down menu. You only need to select this once in either the metrics actuals or budgets – the other one will be automatically updated when you change the first. Refer to the help note Creating Custom KPIs. Run report or report bundle that includes the custom KPI. Refer to the help note KPI Reporting.